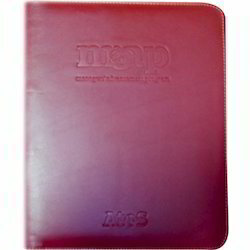 This is Synthetic Leather 4-Ring binder Zipper Bag with 10 thick clear universal punched leaves in side. Left side multi utility pockets for instant paper storage & zipper pockets along with credit/debit/identity cards pockets. Right side pen & writing pad holder pockets. Black & Brown Ring Binder Leather... Rs 180/Per Pc. We fabricate a wide range of Leather File Folders which are liked by the customers for their exclusive designs and smooth finish. They are manufactured using premium quality leather for ensuring greater longevity. They are light in weight and convenient to carry. Our company has gained immense accolades in the field of providing Leather File Holder to the clients. This product is manufactured by our professionals employing advanced machines and utilizes quality tested material. Leather File Holder is commonly used for keeping files, folders, magazines and books in an organized manner. Aided with a team of experienced professionals, we are able to provide an excellent quality array of Black Document Leather Holder in a timely manner. We are manufacturer of executive file folders, conference jute folders, pu folders, exam boards. Leveraging on our extensive market knowledge, we are providing a high quality range of Leather Scorecard Holder. 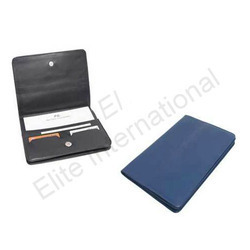 Being the well-distinguished companies in the market, we are into offering Leather File Holder. We are one of the reliable companies in this domain and are into offering File Folder.